Gutsy, relentless, wisecracking P.I. Fina Ludlow is back with her most hard-hitting case yet in the critically acclaimed series by Ingrid Thoft. When soccer mom Liz Barone is attacked in her kitchen and left with a life-threatening injury, Fina Ludlow is hired by Liz's mother to identify her attacker. It's unusual for Fina to take a case that isn't connected to the family firm, Ludlow and Associates, but Liz was in the process of suing her alma mater, New England University—a suit that could be a legal gold mine. Twenty years earlier, Liz was an NEU soccer star known for her physical toughness; however, a serious cognitive decline has soured her soccer memories. She's convinced that her aggressive style of play—and the university's willingness to ignore head injuries in favor of a win—has put her health and her future in jeopardy, and someone needs to be held responsible. Was Liz attacked to stop her lawsuit, or were there other secrets in the seemingly innocent woman's life? Fina convinces her father and boss, Carl, to take the case, and discovers that wading into the financially lucrative and emotionally charged world of collegiate sports requires nerves of steel. As the list of suspects grows and hidden agendas are revealed, Fina wonders if any game is worth the price. Fina Ludlow, a private investigator, is hired to find the person responsible for the senseless attack on a former college athlete/wife/mother. This search will take Fina into the world of college athletic departments, athletic boosters, and even the cutthroat world of science research. Fina has a host of possible attackers and possible motives. 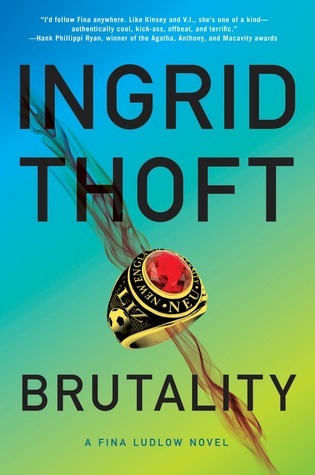 The more she uncovers, the more questions are raised than answered in Brutality, the third installment in the Fina Ludlow series by Ingrid Thoft. Josefina "Fina" Ludlow isn't a typical private investigator. She can be a bit abrupt and has a tendency to step on a lot of toes in her quest for justice and the truth. If juggling her responsibilities to her clients and keeping everything legal isn't difficult enough, Fina also has to juggle her family responsibilities, as well as responsibilities to her father's law firm. To say that Fina is the "black sheep" of the family is putting it mildly. Fina loves her family, but says what she thinks and does whatever she knows is right. Fina has three older brothers and all are partners in the family law firm. Scott is the tough but lovable family man, married with three sons. Scott and his wife Patty, are also playing surrogate parents to their fifteen-year-old-niece Haley (read Loyalty to find out more on that situation). Matthew is closest to Fina in age and is also single. Rand is widowed and has been exiled to Miami (read Loyalty to find out more). Fina flunked out of law school and is a disappointment for her father, and she isn't demure but openly defiant with her mother. Did I mention there's a lot of family baggage and drama in addition to the drama of the investigation? Now that you have a better idea of who Fina is, let's throw into the mix she has two male friends-with-benefits (Milloy - a masseuse and college buddy and Cristian - a police detective), the ongoing battle with her father and brothers to force Rand to stay away from his teenage daughter Haley, and her function as an intermediary between her friend Risa (an adoptee) and her newly found biological aunt. On the investigative side, Fina has to deal with a distraught mother that wants answers, a dispassionate husband with secrets to be uncovered, an athletic booster with a fondness for pretty young female athletes, and someone that wants to derail the investigation by putting a bomb in car driven by Fina. Yes, there's a lot going on in this story, but that is exactly what makes the Fina Ludlow stories so intriguing. The reader doesn't just get to see the professional side of Fina, but we also witness all facets of her life. Ms. Thoft provides a taut story filled with mystery, intrigue, drama, and just the right amount of dark humor to keep things interesting. 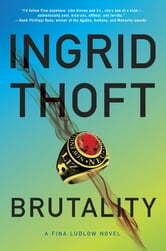 I found Brutality to be a fast-paced and enjoyable read. If you enjoy reading mysteries (not cozy or hard-boiled), then you'll definitely want to add the Fina Ludlow series to your list. If you've already read Loyalty (book 1) and Identity (book 2) in this series, then you'll want to grab a copy of Brutality to read as soon as possible. I can't wait for the next installment in this series just to see what Fina will be up to next. Read an excerpt from Brutality here. Disclaimer: I received a digital copy of this book for review purposes from the publisher via Edelweiss. I was not paid, required, or otherwise obligated to write a positive review. The opinions I have expressed are my own. I am disclosing this in accordance with the Federal Trade Commission's 16 CFR, Part 255: "Guides Concerning the Use of Endorsements and Testimonials in Advertising."